Hands for Hires is a family owned and operated business that provides you with 30 years of experience, quality work and competitive pricing. We strive to help you maintain your home and business with no job being too small. 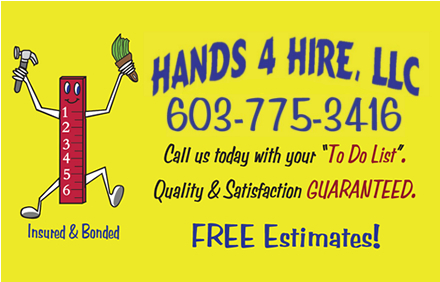 We are fully insured and we service the Southern New Hampshire area . Call us today for your free estimate! We a A+ Rating with BBB! We have a 5 Star Rating with Home Advisor!